If you watch football, you’ve seen the commercials. Guys watching football, cheering, checking their phones… and then winning big money. Who wouldn’t want that? So is this just pure football fun… or a foot in the door to gambling? Gronky Kong. Brady Gaga. Luck Dynasty. Those are just a few of this year’s most popular fantasy football team names. And teenagers are some of the biggest drivers in this booming industry. Even if you don’t play them, you’ve heard of fantasy football leagues. It’s the game-inside-the-game that gives millions of armchair quarterbacks the ability to build and manage – and in many cases, bet on – their own customized sports team. Participants simply choose their favorite players – from any professional or college team – and hope they don’t get injured (or arrested) as they accrue points across the season. It’s a big business that’s only getting bigger. According to experts, almost 75 million Americans, age 12 and up, will participate in some sort of fantasy football league this year. The popularity of sports-based leagues has even spawned a fairly popular TV show. The League, a comedy that follows the lives of a group of friends who are in constant competition with each other, airs on FX every Wednesday night at 10pm. Many fantasy players compete simply for the fun of it. Some will try and make some money. Others will try and make lots of money. Experts project that $4.6 billion will be spent by enthusiasts this season alone. It might be a make believe game, but those are some real world dollars! Gambling? Not by federal standards (Unlawful Internet Gambling Enforcement Act). But don’t think interest in fantasy football is limited to a bunch of overweight guys crammed in a basement reliving their glory days. Roughly 1-in-5 women will also put together a team to compete this year. Yet the fastest growing demographic in fantasy football leagues is kids. According to Paul Charchian, the undisputed guru of the game, “Our fastest growing demographic is under 18 [year-old] players; young adults and children are our fastest growing segment.” In fact, teenagers are dominating adults when it comes to percentage of players. 13% of adults play while 20% of 12-17-year-olds play. Fortunately, it seems as though most teenagers are just playing for bragging rights in spite of the fact that many of the leagues embrace gambling. But there are still more options available to gridiron laymen. DraftKings, which guarantees more than $1 billion in prizes for 2015, is also designed for wanna-be coaches. The similarity between them and FanDuel is obvious, starting with their comedic commercials like “That’s The Guy” and “Sock.” In fact, there’s so much similarity in the competition between these two particular companies in the past that legal action has been threatened between DraftKings and FanDuel. 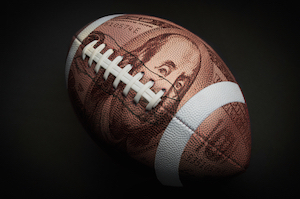 With that much money up for grabs, there’s bound to be some unnecessary roughness…. Sports are in the veins of many American families. In fact, the romance we have with all-things-ball has caused many parents to (wrongly) believe that their kid has what it takes to turn pro. This article breaks down most professional sports, but one glance at just the football statistics reveals how delusional we can be: out of the nearly 1.1 million high school players who put on pads, only 6.5% will play in college…and 1.6% of those college athletes are drafted into the NFL. In other words…the only way most kids will be involved with professional sports is through fantasy leagues. Fantasy football leagues will continue to pop up to satisfy the demand of those who love sports. Here are a couple of ideas to help parents and youth workers seize this sports-based opportunity to impact the lives of teenagers and avoid the ugly side of gambling. If possible, make this activity a family affair. Plenty of families eagerly await football season so they can put together a family team and enjoy the sport together. Tap into the fun of the competition without it becoming an out-of-control addiction. In an era where every room has a TV and each member is sitting in front of one all alone, fantasy football gives families the ability to enjoy screen time together. Don’t forget to lay some ground rules. Rule #1, never deflate footballs. Ever. Rule #2, set guidelines for aspects of competition such as behavior and screen time. Somebody has to lose; make sure the expectation of graciousness is clearly communicated to everyone. But also make sure that your family members’ time isn’t completely consumed by a smartphone, tablet, laptop, or TV. It’s easy to get carried away with the idea of winning. Ensure that the biggest prize is quality time spent with one another. Rule #3, join just one team. Today’s young people don’t need to be playing the odds with multiple teams. Help students see this as a fun experience, not a chance for quick gain! Don’t let fantasy become a foot in the door for gambling! Help your kids understand that competition could be fun, but isn’t usually a moneymaker. Commercials make it look like everyone is walking away with a check in their hand. Sadly, that’s not the case. And for many, gambling can become a harmful addiction that tears families apart. Make sure your heart isn’t being drawn to the lure of quick gain (Proverbs 28:20). Demonstrate the fun of the competition even when there isn’t a cash prize at the end. Fantasy football can be fun… or it could tempt people to something else. You decide if it’s right for your family.